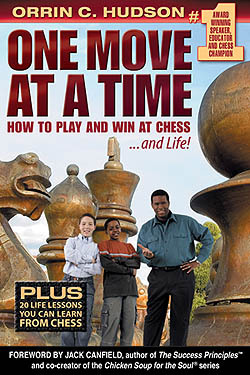 Eight years ago, Orrin Hudson released his instructional book, “One Move at a Time“. The book is filled with basic instruction enveloped in motivational messages throughout. He basically toted his book along on his speaking engagements. By his account, he has sold 4,000 copies. Recently, Hudson decided it was time to put the book on Amazon to push the distribution. Upon listing the book on the “world’s largest bookstore” he has moved from #700 to #1 on the Amazon best seller list. There was no data given about the number of sales in the chess category. Each of the twenty chapters center on many of his lessons and is chockful of motivational motifs. There are some exercises along with an annotated blitz game Hudson won against Rashid Ziatdinov, a strong master. The game was featured twice in the book as an instructional game. When asked why he had not listed the book before, Hudson mentioned that he did not understand the power of social networking. Certainly, social networks were in their infancy in 2008. Let’s hope eight years later, the book will finally get the recognition it was due. 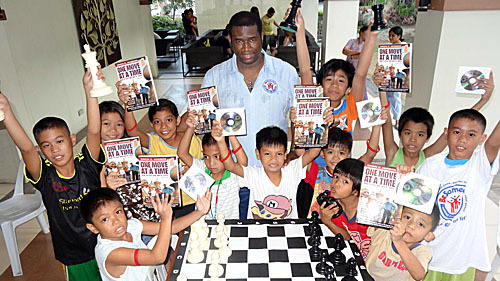 Hudson in the Philippines with copies of his book, “One Move at a Time“.